When it comes to Twitter, many users are so focused on either how many people they’re following, or how many people are following them or how many tweets they have. We live in a world of numbers and it can be difficult to separate yourself from trying to get the larger number. Perhaps the number isn’t what’s important, it’s how that number is relative to your account. We have a desire to be popular. We want more people to listen and care about what we are saying. A higher follower count will make it seem that you have a lot of followers, but are they really following what you have to say? Are they robots/spambots? This is not to say that you don’t ideally want a high number of followers. What I am saying is you have to know WHY you want more followers. What do you want out of Twitter? The number isn’t everything to all users when they look at your profile. It may feel like you are popular, but do you actually communicate with all those followers, or are they just a number. One client of mine wanted a strong follower/following ratio on their Twitter page. They wanted more followers than who they are following. I can see the reasoning, but in the end, who cares. You will want to follow those who provide the best content and the most engaging relationships. If that is more than who are following you, so be it. Social media is about the sharing of information and the formulation of relationships. You’re sharing information with your followers, why not share the information from them as well? This will help your account build relationships. 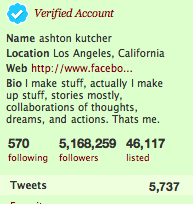 Yes, some accounts have five digit numbers of tweets, some only have three digit counts. Quantity is important in tweeting, however nowhere near as important as quality of the tweets. Think of it this way, would you enjoy following someone who tweets about every mundane thing in their life, every minute? Usually you don’t. However, those who tweet valuable information and insight are the ones you can’t take your eye off of. Basically, it’s great to have a high number of tweets, but make them count. In social media, numbers are valuable, but they’re not the whole story. You need to have the content, value and relationships along with those numbers to build a strong social media presence.